Altruism is reflected in actions by one individual that benefit another, even when there is no expectation of reward. Altruism is often equated with selflessness and contrasted with selfishness, or alternatively, altruism is seen as other-regarding as opposed to self-regarding behavior. The latter usage is sometimes preferred because of difficulties in classifying behavior for which the individual acting altruistically receives a "warm glow" from helping others. The question raised in this instance is whether such an individual is actually selfish and, if so, whether there is any behavior that, after the fact, could not be interpreted as selfish. The need to preserve altruism as a meaningful behavioral category leads to an emphasis on objective, observable measures of welfare. Thus, an individual who sacrifices health, material wealth, or physical comfort to benefit another can be viewed as exhibiting altruism whether or not he or she receives personal satisfaction from doing so. In biology, altruism refers to behavior by an organism that improves the reproductive fitness of another at the cost of reducing the reproductive fitness of the actor. This entry discusses altruism as it has been explained and defined over the years. Copyright © 2016 Sage Publications. Reprinted with permission. Field, Alexander J. 2016. 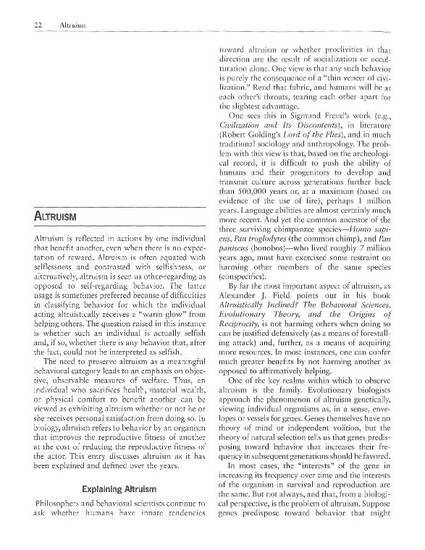 “Altruism.” In Sage Encyclopedia of Theory in Psychology (Sage Publications: Thousand Oaks, CA), pp. 22-24.